I’ve been looking forward to Passenger ever since I read the synopsis last spring. The mix of music and time travel sounded like a fun combination and I’m so excited that release day is finally here. Passenger captivated me with its unique characters, fast-paced action, and interesting historical locations. Etta has been thrown into the world of time travel with no background or experience whatsoever—just like the reader—and part of the appeal of Passenger comes from learning about the rules surrounding time travel at the same time as Etta. She goes from being focused on her violin debut performance to time traveling across the globe to find a missing object and save the world. I loved Etta’s determination to figure everything out despite her lack of prior knowledge and her instinct to do anything for her loved ones, even when it wasn’t necessarily what she should do. 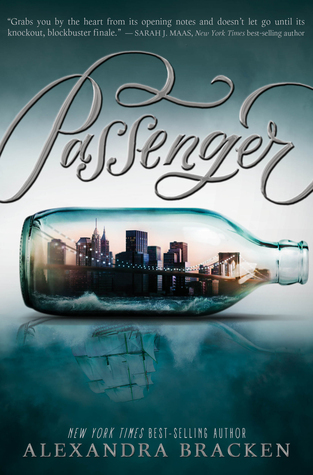 While marketed as fantasy and historical fiction, I think Alexandra Bracken and Passenger deserve kudos for having some great mystery elements as well. There is an incredible amount of detail woven into the story and so much that seems insignificant at first comes to play a large role later on. Alexandra Bracken does a great job of making each setting distinct and detailed and she takes us to some great places. Time travel can be confusing but I found it easy to identify each place and time due to the thorough descriptions. As far as the time travel component itself, I think that is explained well. There are one or two questions I still have but overall, the method of travel in Passenger is unique and magical. I should note that the beginning felt a little slow to me the first time I read it but looking back, I see how crucial those chapters are to the story. There are so many vital details and clues woven in right from the beginning. I really liked how some of the introductory information was relevant later on, especially with Rose and Alice’s characters. As a violinist, I may be biased but I loved the inclusion of Etta’s musical lifestyle in the beginning of the novel and appreciated the references made to it throughout Passenger. I just wish it hadn’t been so limited to the first few chapters! The relationship between Etta and Nicholas is really sweet. While it initially feels a little like “love at first sight,” it really is based on their similarities and develops slowly throughout the novel. We get to know both characters individually and that makes it easy to understand why they are great together, despite their differences. I’m so curious to see what kind of solution Bracken comes up with for them in the next book. Passenger is definitely worth checking out for fans of fantasy and historical fiction. The attention to detail and description is wonderful and will transport you to other times and places right alongside the characters. Just be prepared for a cliffhanger that will leave you dying for the sequel, Wayfarer!